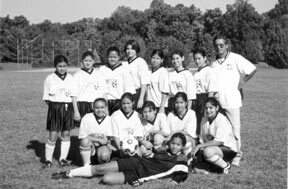 Mr. John Alcoba and the girls on this soccer team would agree that there are many benefits for participating in sports. Why do so many teenagers who participate in different variety of sports like soccer, football, and track and field, etc.? Are they thinking that sports are important for them? Well the truth is yes, sports are important for teens. First of all sports keep a student very active. Dahir, a private soccer team coach who has been coaching soccer for five years, believes that sports are like a job that they have to work hard at to be good and useful. "I can feel the kids' intensity during their practices as well as their games," he said. Also sports keep teens from using inappropriate things like drugs and keep them from joining gangs. Ronnie, a 13-year-old middle school student said, "I am addicted to football instead of cigarettes. I can't do both of them." He chose football rather than cigarettes. "It keeps me out of the street," Nery Martinez, a 17-year-old junior said. Nery loves soccer and participating with Blair's track and field team. He added that he doesn't have any time be part of a gang or to go look for something like drugs that will damage his body. Also sports makes teens maintain a healthy body. "It helps me relax during the night and it makes me energetic during the day." Nery said. Also Abdul, a Blair student and a soccer player said, "It feels great playing soccer. I think I can do about anything from jumping to running without losing my breath," he said. Before he played regularly, he said he couldn't do that well. Sports also helps teens mentally. "I feel smart playing soccer," Eric a soccer player said. "It makes me make the best and right decisions." Coach Dahir summed it up well. "Basically they make the best moves in their life as they do in the games. They avoid the bad moves and go for their goals,"